Sit down, kiddies. Let me tell you a story. Where do I even start with this book? I first heard about it around the time everyone was attending BEA. I can’t remember where I first saw the cover but as soon as I did, I was in love. I immediately ran to Goodreads to check out the synopsis and knew I had to read it. Borders strained, checkpoints broke, and of course people started shooting, because that’s what passes for problem-solving among humans. See, guys, this is why you can’t have nice things. So sassy, right?! I actually laughed out loud at that part. I’m not ashamed to say that I would pay good money for a book of just the Utterances of Talis. He’s brilliant and cruel but somehow also makes you love him. It’s rare that I manage to like the bad guy but Bow left me no choice with this one. I will also never understand how or why it happened but the goats were some of my favourite characters as well. They never say a word but they’re wildly interesting. If there’s mischief, you can almost bet on the fact that the goats are involved. I seriously love them. My last character love-fest is about Elián. He’s a trouble maker, stubborn as a goat (ALL THE GOATS), incredibly quick-witted, and a little sassy in his own right. I admire his strength and rebellious attitude. I also love that he’s able to (at least to an extent) reign it in for the good of the others. Often the trouble maker “just can’t help it” or doesn’t seem to really care what his actions do as long as they further his cause. In his case, however, we see some remorse and that he realizes he’s hurting his friends who care about him. The events of this story create such a great atmosphere. It was tense, complex, and exhilarating. I definitely felt my heart racing and had anxious moments while I was reading. Between the things I wanted to happen, things I didn’t want to happen, and having zero idea what the heck was coming up, The Scorpion Rules kept me on my toes. Even the ‘slow’ parts were incredibly exciting. How…just how?! I also loved how Bow showed how deeply flawed Talis’ system of rule is. Obviously, as humans, it’s highly unlikely we’ll ever find a system of governing one another that is absolutely perfect. All the same, Talis seems pretty pleased with himself and the setup he’s put in place. You can tell he derives immense pleasure from the power he has and the ease with which he exercises that power (even to brutal extremes) is astonishing. It’s also an eye-opening look at what we could come to as a society if faced with extreme shortages of resources. 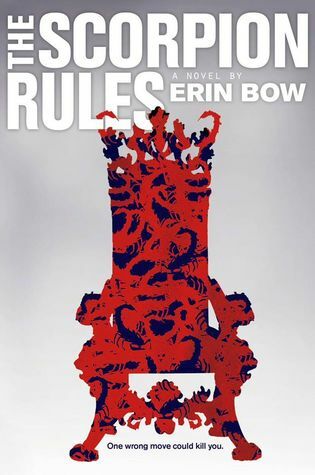 The Scorpion Rules is an interesting look at what is necessary, what we think is right, and what we want to do. It’s rare that any one action covers all three of those things, and Bow’s book explores just how difficult choosing between these options can be. What is often necessary for the safety and best interest of the majority isn’t always the most pleasant decision for some. The way Talis has set up his society, the few must sacrifice to keep things working for the many. In this case, the ‘necessary’ happens to be sacrificing human life which is, naturally, a more distasteful thing for most to accept but that’s what makes Bow’s book so amazing. Sh wasn’t afraid to get messy and explore the not-so-pleasant side of human nature. loved this. we loved such different things about this book! !